Katharina Günther-Keßler was born in Weimar in 1984 and has been smitten by the charm of the small town of her birth ever since and forever more. 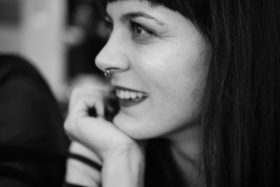 She studied Visual Communication at the Bauhaus University located there and now works as a freelance graphic designer. When she is not in her dearly-beloved “kitsch” office, secretly plotting to radically embellish the world, she works in the most wonderful children’s shop in town or is out and about on the roads of Europe in her old-timer “Lulu”.